"New ""copy"" 3/4"" RCA type knobs, black w/white line, standard 1/4"" shaft KA"
3/4"" RCA type skirted knob, black with white line. 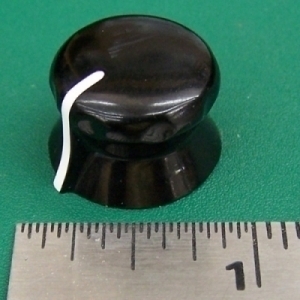 This is a new plastic molded copy of the well known RCA bakelite knob that was made by Viz. Fastens with two 1.5 mm set screws. This item is not returnable.